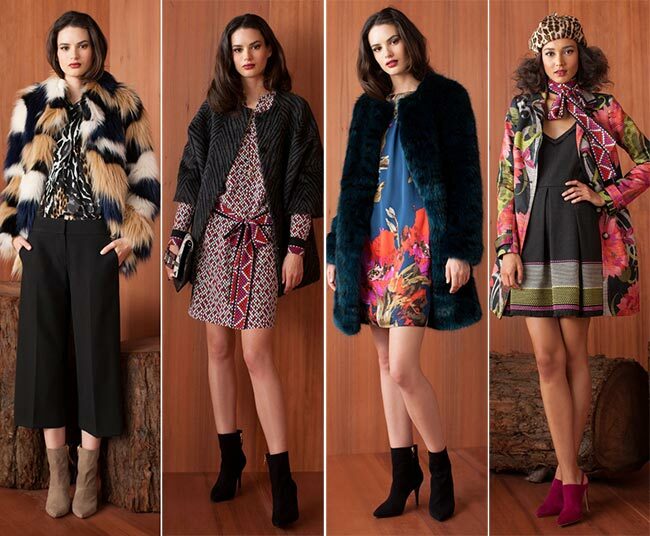 The Trina Turk fall/winter 2015-2016 collection celebrates the brand’s 20th anniversary through enchanting bright prints and colors, multicolor tweeds and retro-inspired silhouettes. The designer turned to “multi-culti San Francisco’ for inspiration, transferring the city’s energizing spirit to her one-of-a-kind designs that are bold, cheerful and elegant at the same time. The iconic Californian style so characteristic of Turk’s designs can’t but be here too, looking especially bedazzling with the Fifties silhouettes and occasional Sixties touches. Diversity is the next characteristic feature of the collection, which brings mini dresses, classy culottes, jumpsuits, pants and skirts to the scene, as well as a big array of stylish outerwear options. Multifaceted is the best word to describe the Trina Turk fall/winter 2015-2016 collection, which manages to cater to the style needs of different women, both those business ladies trying to look elegant and feminine at the office and the modern fashionisers, who are fond of playful prints and lovely little dresses with a distinctive retro touch. 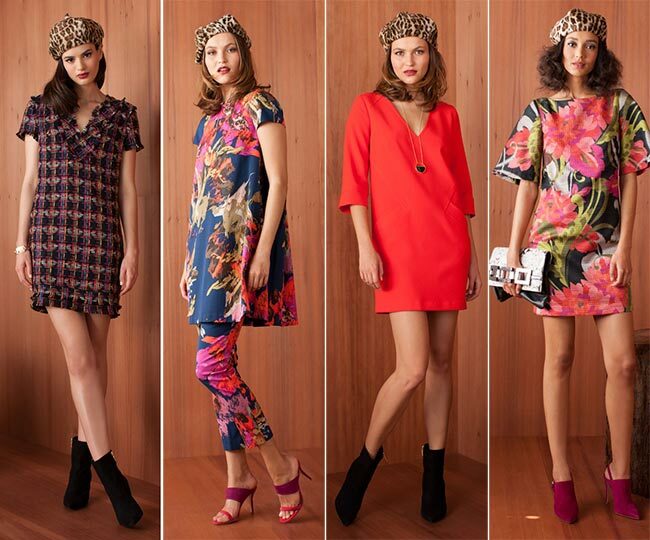 In any case, the designer manages to bring a bright mood to the fashion world through the bold fusion of lush floral prints, graphic geometric motifs, abstract and leopard patterns. The Trina Turk woman manages to transfer a pocketful of sunshine with her to the cold months of fall, not ditching typical summer-y prints and colors. Alongside those heavily printed little dresses, shirtdresses, tunics worn over slim-fit culottes, trench coats and skirts, a big part of the collection is devoted to a much sober and timeless style, where pants are the protagonists. Usually cut at the ankle length and featuring flared shapes, they come in classic and monochrome shades such as black and cream, bring timeless staples especially perfect for those working class ladies and those, who like to show off their feminine and elegant side on various occasions. Especially striking is the black palazzo jumpsuit that is all about modern minimalism with a beautiful Seventies vibe. Add some bright accessories to it to get ready for party nights or keep it more simplistic for work. Turk has managed to skillfully combine different fashion eras in her small collection, bringing the Sixties through the graphic printed tunic, the Fifties through the leopard top and the Seventies through the palazzo pants. Moreover, there is a vast diversity of stylish outerwear options available too, including colorful faux fur coats, tweed and plaid coats and options with faux-fur collars. Whether she’s dressing up or dressing down, Trina does it colorfully and boldly this fall, after all she knows what the typical Trina Turk customers expect from her. 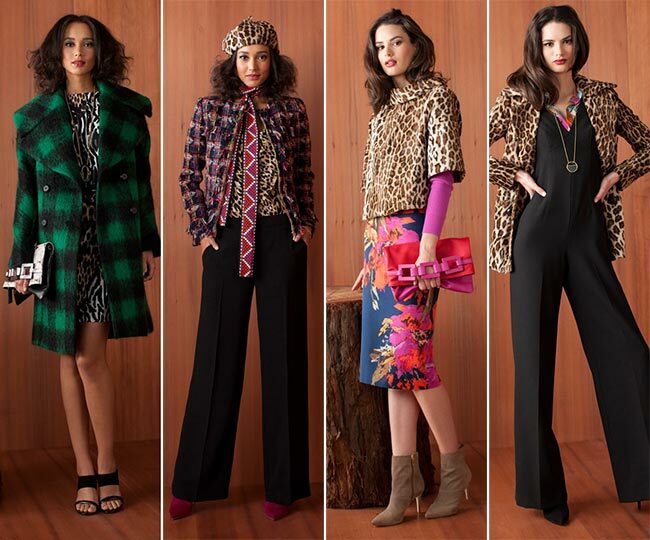 Overall, the Trina Turk fall/winter 2015-2016 collection is an eye-pleasing and extremely wearable line filled with some of the most amazing trends for the upcoming fall season!